Lenovo’s given the ThinkPad X1 a super-charged moment with the ThinkPad X1 Extreme, with included discrete graphics. This machine has an Intel CFL-H series CPU inside with up to 6 cores and up to 64GB memory. This laptop comes with a body quite similar to its predecessor, coming with a cool four layers of reinforced carbon fiber up top – it’s far less bustable than most. The ThinkPad X1 Extreme has graphics processing power the likes of which would have seemed a bit bonkers only a few short years ago. Inside is an NVIDIA GeForce GTX 1050 Ti GPU. Lenovo and NVIDIA suggest this is ready to kick out photo editing, video coding, and gaming too. The display is 4K HDR with Dolby Vision, and this computer is Dolby ATMOS capable, too. Much like its predecessor, this machine has a “ThinkShutter” mechanism to close the door on its above-display camera. It’s literally a sliding component that blocks the camera – and it’s super effective. On the other end of the spectrum (for those that care far less about the extreme privacy part of this equation), this machine has Far Field Voice and Wake on Voice capabilities. They’re secure, sure, but those of us that remain paranoid about all things always listening find it strange to include both that and this on the same machine. There’s a slightly smaller power supply on this machine compared to the most recent model. Thats a “25% smaller 135W power supply” as it were. This battery, says Lenovo, provides up to 15 hours of battery life with Rapid Charge. There’s an External Pen with tilt and shade function, and the notebook comes with a handy-dandy fingerprint scanner to log in with Windows Hello. The whole machine is 18mm thin, and it weighs in at just 1.7kg. 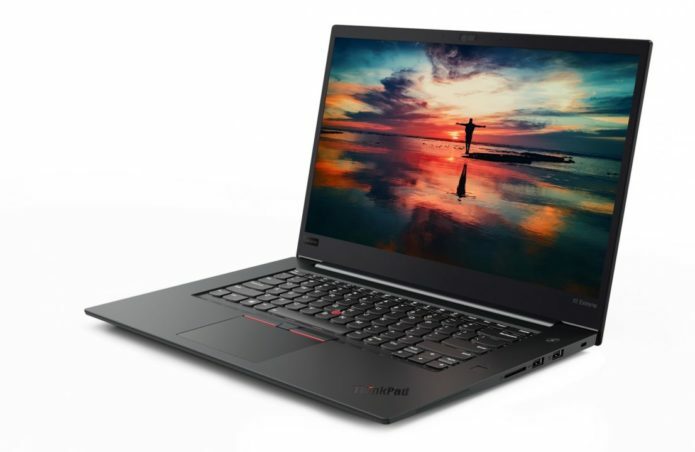 This machine will come in any color you like, so long as it’s “ThinkPad Black.” Users will be able to find the machine starting at approximately $1860 starting in September of 2018.